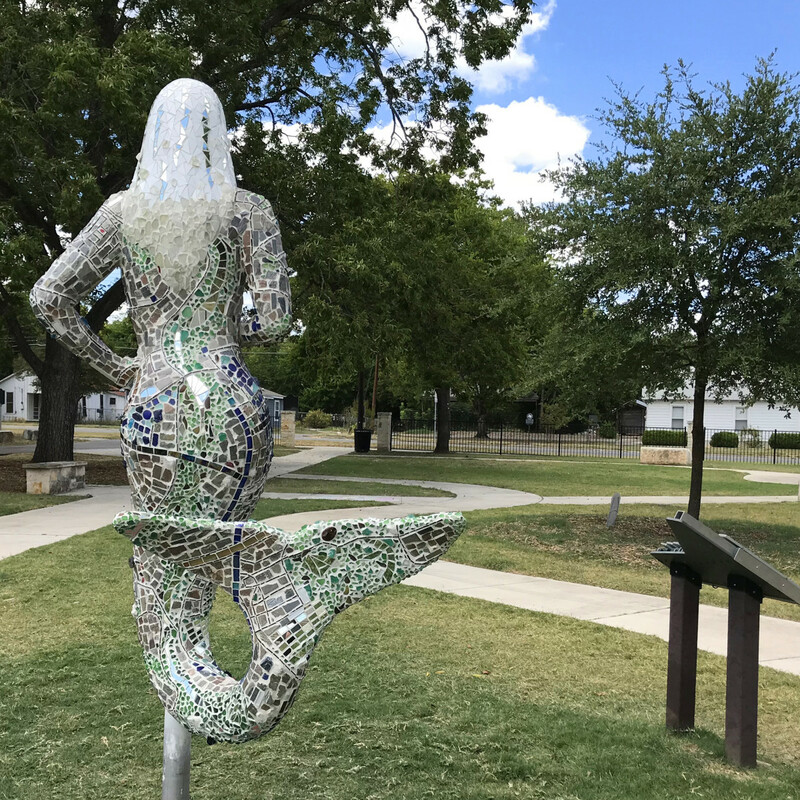 You might think it's odd for a city in the Texas Hill Country to use a mermaid as its unofficial mascot, but mermaids actually have quite the history in San Marcos. 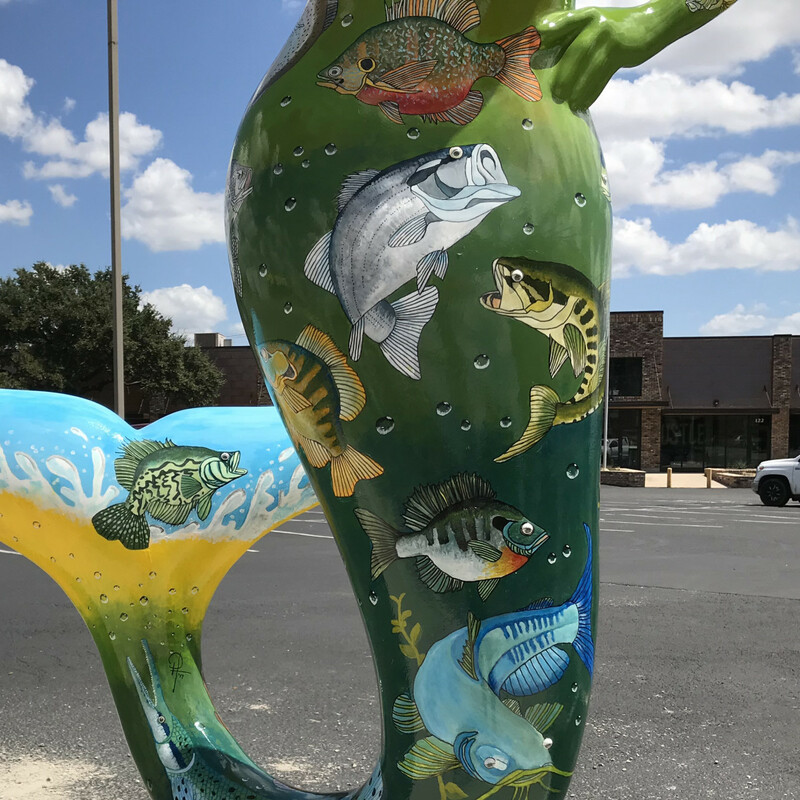 From being celebrated in parades and fairs to even having its own society, the mythical creature has fit right into the quirky and colorful — albeit inland — Texas city. 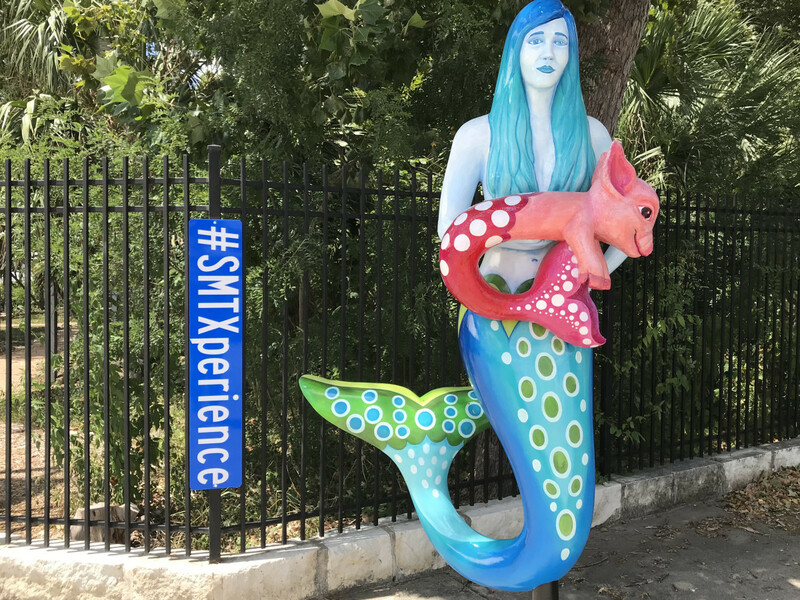 Now San Marcos is home to 10 7-foot-tall mermaids who are placed in different locations around the city. 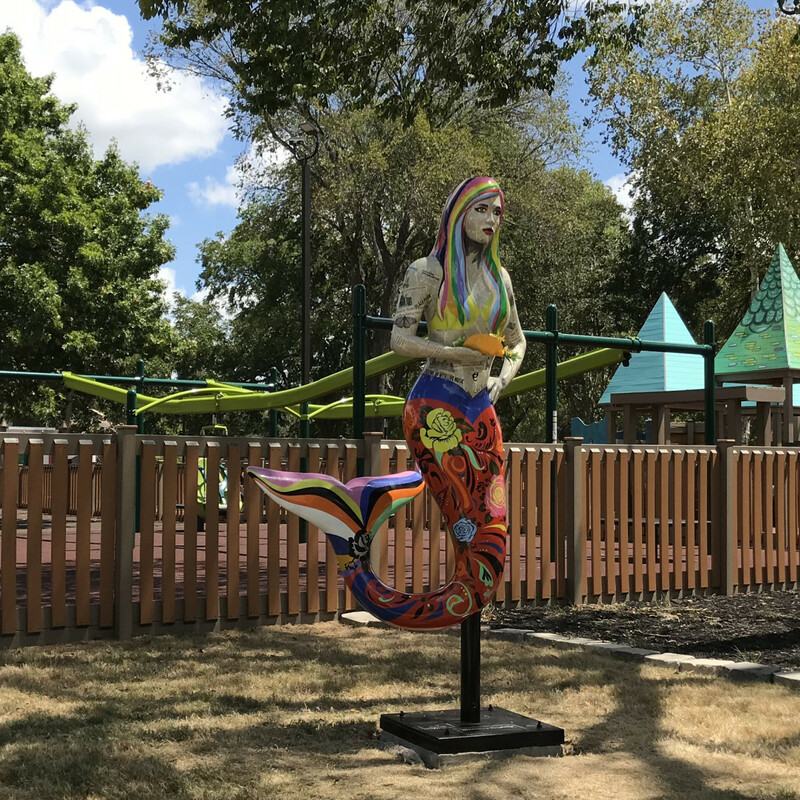 The Mermaid March weaves the city's rich history, culture, and wildlife into the different mermaid forms. Here's a closer look at the sculptures — and the artists behind them. 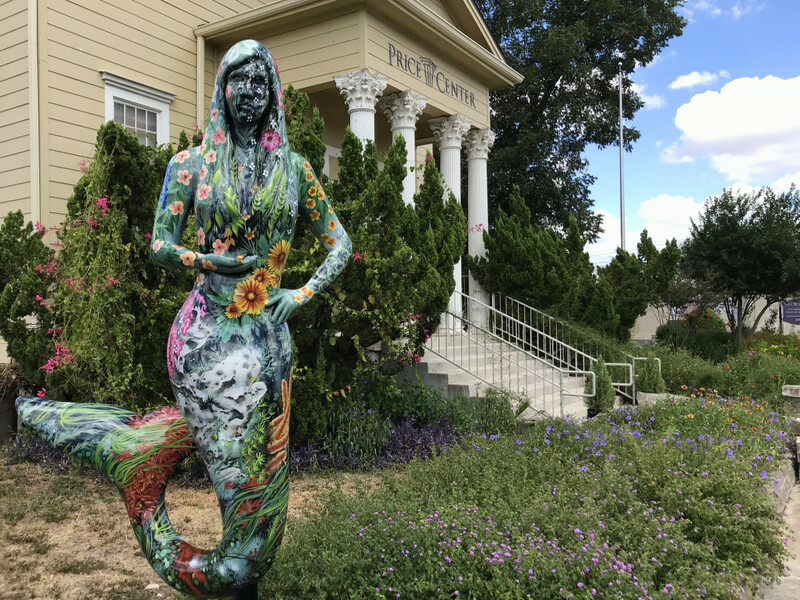 Hofmann drew inspiration from the interwoven stories that create San Marcos, literally covering the mermaid's body in clippings from the San Marcos Daily Record. Some of the clippings have personal meaning for Hofmann while some are personal to others — "we all have a story," she says. And don't miss the adorable fish taco she's holding, a detail that Hofmann included to bring a pop of color and humor to the statue. Park is a Central Texas artist and musician, specializing in cut paper, stained glass, and graphic design. She has also performed as the frontwoman of The Blue Hit and is currently the founder and frontwoman of local alt-folk band The Deer. Roads, train tracks, and waterways coexist on the mermaid's body, beginning with Aquarena Springs on her eyes. 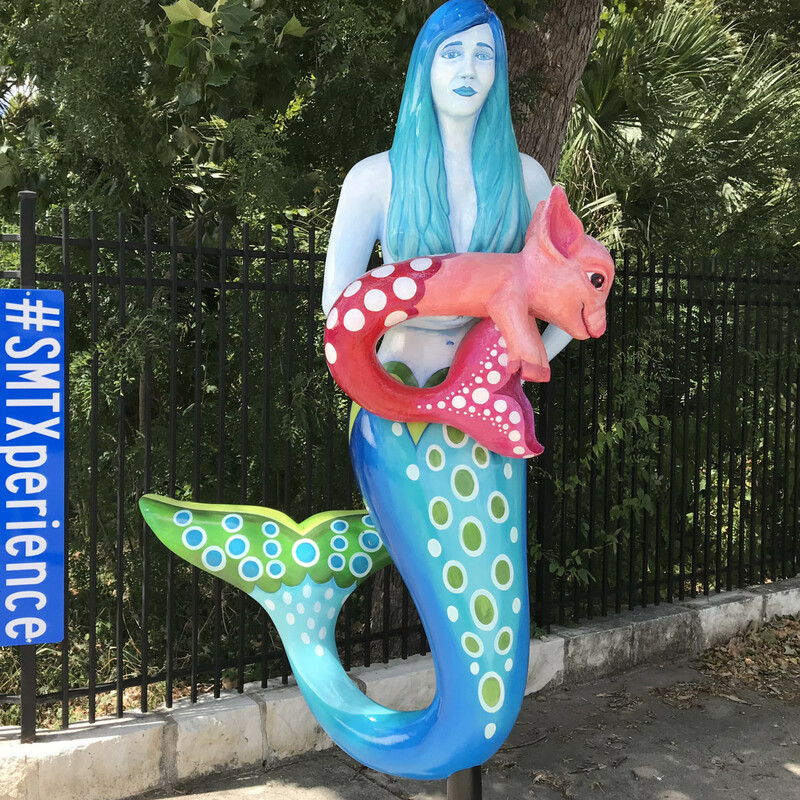 The mermaid stands as a protector of San Marcos' natural resources, showing that nature and civilization are one and the same ecosystem. According to Park, "The map ... draws to attention the necessity of balance and mindfulness as this small town expands." Layman is a self-employed artist and graphic designer who works with a wide variety of mediums. Her creation is painted with thermachromic pigment, meaning that when the weather is cool, the statue appears black, but once the temperature reaches over 86 degrees, the statue becomes an explosion of color. 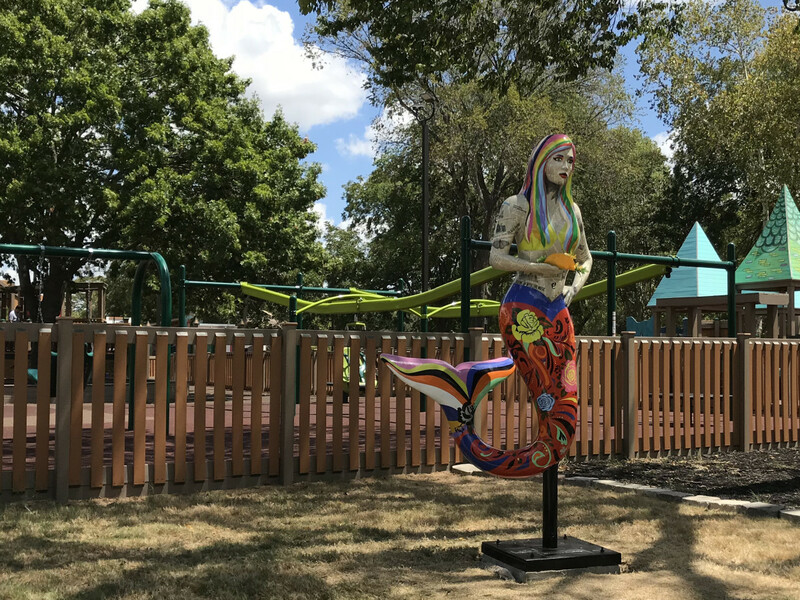 Located on the corner of San Antonio and Comanche streets, this statue's colorful array of florals echoes the gardens of the nearby Price Center. Egan is a tattoo artist specializing in folk art-style flower art, so the native blossoms of San Marcos were a natural focal point. But they weren't the only inspiration in her design: Egan had Dianne Wassenich, the executive director of the San Marcos River Foundation and the person who tends the gardens at the Price Center, in mind when she created it. "She is the real-life embodiment of everything the mermaid is supposed to represent: a passionate devotee to beauty for its own sake; a cultivator of healthy natural systems," says Egan. "She tends to the river as if it were her garden, and knows every blade of rice and muddy patch. 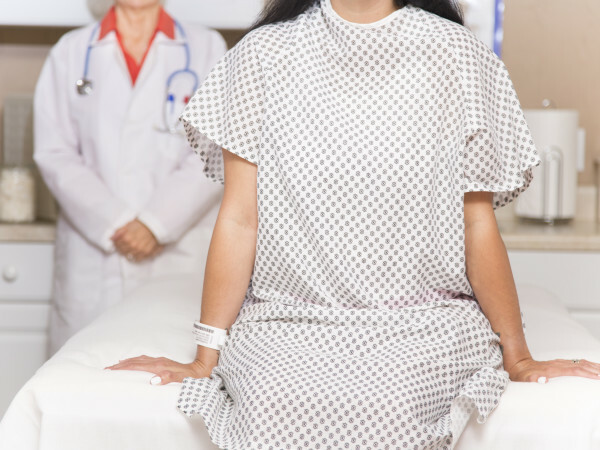 She understands above all the work that must be done." 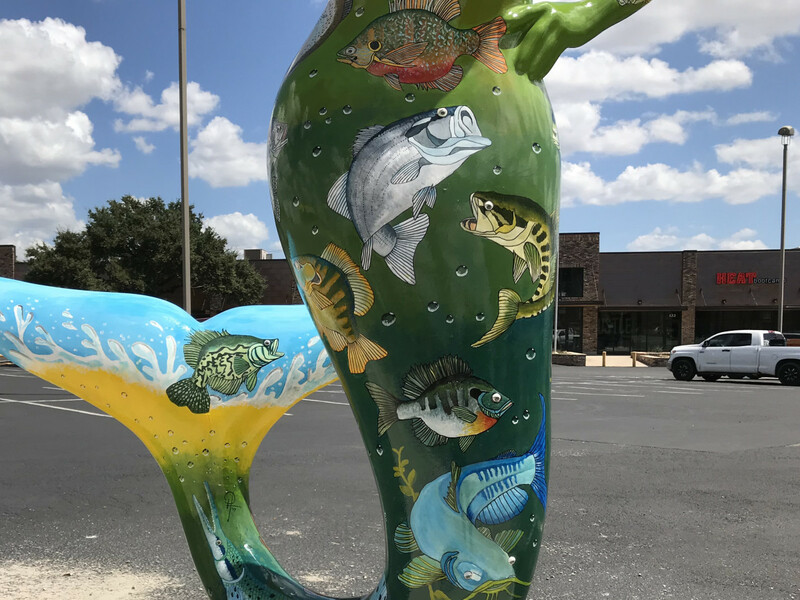 This statue can be found at the corner of MLK Drive and Guadalupe Street and is covered with native fish from the San Marcos River. A professional wildlife artist, bestselling author, high school art teacher, and travel enthusiast, Hiser creates art prolifically, whether it be murals, logos, or fine art paintings. He wanted to "capture the diversity of fish in the clear, cool waters of the area and illustrate what people see when touring in the glass-bottom boats." From a distance, the mermaid — located on Hutchison Street outside Minute Man — looks to be painted a simple black. But as you get closer, the magic of Mirrachrome paint comes alive. The paint is smooth and reflective like a mirror, and viewers can see their images reflected on the mermaid's surface. Wood, a painter living in San Marcos, explains, "I am stunned by the tiny differences in lighting in a subject from one moment to the next, and I am compelled to paint them." 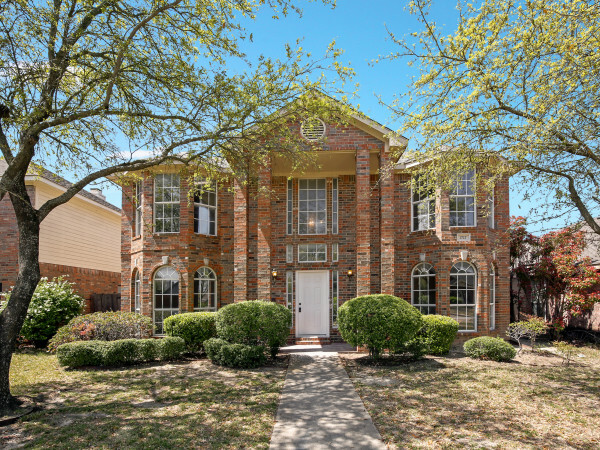 McKinney was inspired by the old Aquarena Springs theme park and its attractions. He chose a pop art-style collage to depict the boats, structures, local fish, Ralph the Swimming Pig, and mermaids. McKinney wanted to keep the viewers engaged with the piece as they searched for each element in the collage. The inspiration here is the creation story of the Coahuiltecan people, who were said to have started as spirits who wandered the underworld before emerging from the Sacred Spring and being guided by their guardian spirits of Deer, Eagle, Jaguar, Wolf, and the Waterbird. Weems collaborated with the Indigenous Cultures Institute to ensure that the design was appropriately representative of Native American folklore and imagery. 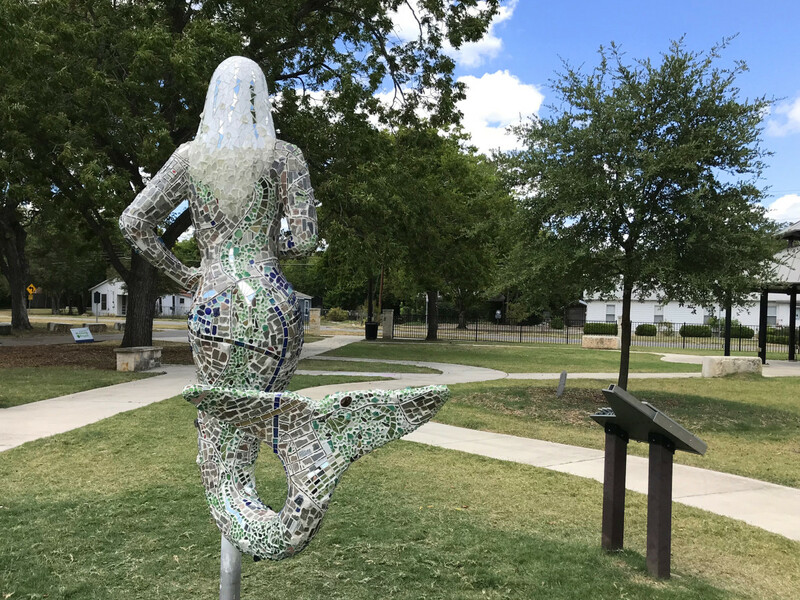 Located at the San Marcos Activity Center, this mermaid is a celebration of the San Marcos River and the interactions between wildlife and landscape. According to Shelton, "This amazing place allows us 'humans' to remember that we are part of a larger ecosystem. We are a part of this river as much as it is a part of us." Latimer was inspired by childhood memories of the commercials for Aquarena Springs and Ralph the Swimming Pig. According to Latimer, "The idea of combining the mermaid with a fantasy version of Ralph just makes me smile. It is bright, fun, and unique, just like the city of San Marcos." 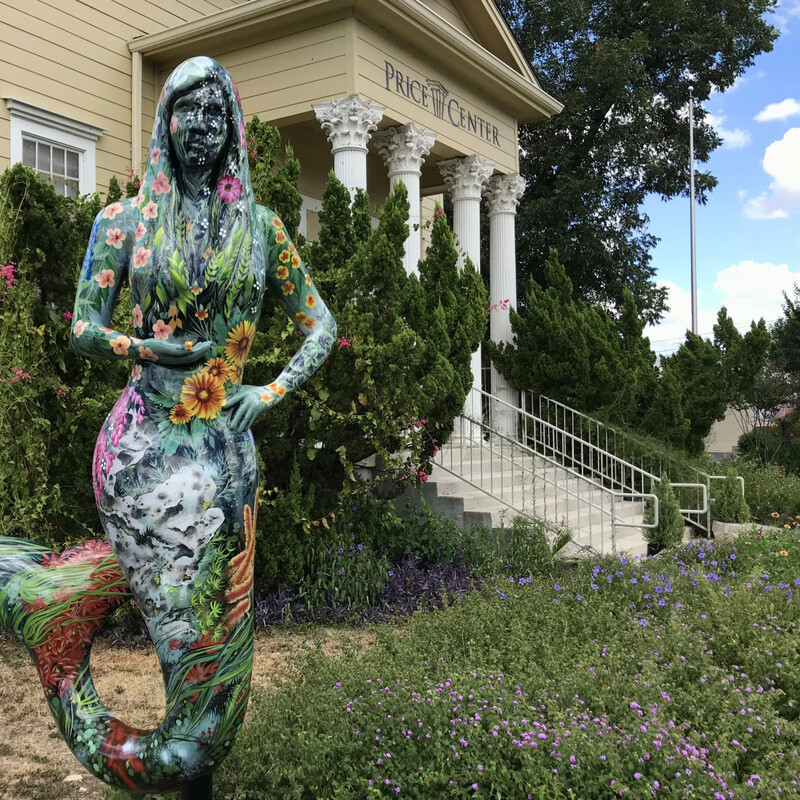 Swim into town the weekend of September 22, when the Mermaid Society of Texas hosts the Mermaid Society Ball, Downtown Mermaid Promenade, and the Mermaid Aqua Faire.